An open meeting to discuss the morality and ethics of nuclear weapons was held in the House of Commons on Thursday 21st April. Hosted by Seema Malhotra MP for Feltham and Heston and Shadow Chief Secretary to the Treasury, the meeting was intended to give MPs an opportunity to consider some of the ethical dimensions of the issue of nuclear weapons, ahead of a vote in Parliament on the renewal of the Trident missile system later this year. Ruth Cadbury MP explained that as a Quaker and someone who went on CND marches as a child, she is instinctively against Trident renewal – but that she is keen to debate the ethical arguments for and against nuclear weapons. Martin Birdseye of The Heston Justice & Peace Group, Pax Christi and Christian CND, presented his Nuclear Morality Flowchart, a decision tree to help people resolve, one way or the other, the ethical problems posed by nuclear weapons. Citing the abolition of the Slave Trade, Martin Birdseye said, “Just over 200 years ago, this Parliament, and eventually the rest of the world, voted to make the Slave Trade illegal. The arguments were often about economics and politics and even national security, but the driving force was the moral issue and that is what is remembered today – the slave trade and ultimately slavery itself, became universally unacceptable, morally abhorrent, “repugnant to the principles of natural justice”. That is why we, and humanity as a whole, can never collectively go back to it. Our hope is that by making clear moral judgements this parliament will begin to do the same for nuclear weapons”. Martin’s full remarks can be read here. The Rev. Dr Sam Wells, Vicar of St Martin-in-the-Fields, writer and teacher on Christian Ethics (visiting professor at Kings College London), presented an overview of some of the philosophical and ethical arguments for and against nuclear weapons, concluding that there is no ethical justification for the use or threat of use of such WMDs. Rebecca Sharkey, UK Coordinator at ICAN, talked about the role of morality and ethics in shaping the laws of war, otherwise known as International Humanitarian Law. She outlined exciting new developments in the international Humanitarian Initiative on Nuclear Weapons, which are laying the foundations for a new treaty which will put nuclear weapons on the same moral and legal footing as other WMDs such as chemical and biological weapons. An important resolution voted in at the United Nations General Assembly last December, entitled Ethical imperatives for a nuclear-weapon-free world, declares that “given their indiscriminate nature and potential to annihilate humanity, nuclear weapons are inherently immoral”. This resolution was adopted by 124 votes in favour and 35 against (the UK voted against) and sets the stage for commencing negotiations of a new treaty to prohibit and eliminate nuclear weapons. A new UN working group is meeting at the moment in Geneva to develop “concrete effective legal measures, legal provisions and norms that would need to be concluded to attain and maintain a world without nuclear weapons”. 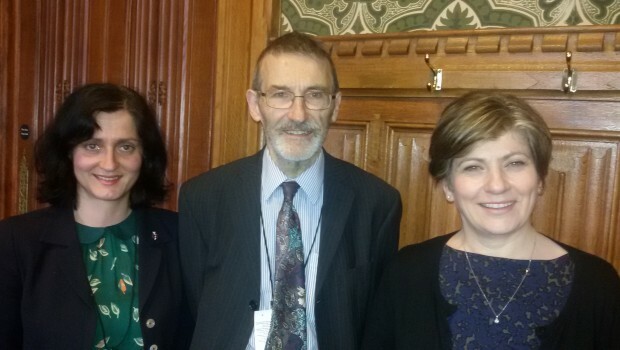 Shadow Defence Secretary Emily Thornberry MP, who is currently conducting a consultation on the UK’s nuclear weapons, came to lend her support to the meeting (in the photo above with Rebecca Sharkey and Martin Birdseye).